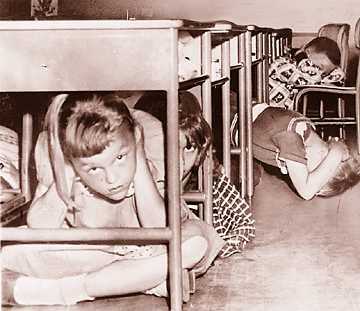 It should have come as no surprise to anyone who has paid any attention to Michele Bachmann over her second term in Congress that her campaign strategy with regard to debates this year would follow the old nuclear attack films shown to grade schoolers in the 1950s: duck and cover. The Teabagging congresswoman has shown nothing but contempt for her constituents and anyone but the most accommodating and fawning media since her infamous appearance on Chris Matthews’ “Hardball” that almost derailed her re-election in 2008. Once secure in her $174,000 government job for another two years, Bachmann has thumbed her nose at media requests for interviews and clarifications of her half-truths and outright lies. She holds the record at the Pulitzer Prize-winning PolitiFact of the St. Petersburg Times newspaper for Pinocchio-like behavior, racking up an incredible 0-11 record for telling the truth. Bachmann has held only one public meeting during her entire four years in Congress at which constituents have had the opportunity to address her unfiltered by screeners and staff. Instead, the invisible congresswoman has opted for the safety of one-way communication through faceless “tele-town hall” meetings during which she and her handlers determine which constituents and questions she will respond to. During this campaign season, Bachmann has predictably ignored invitations to debate her two opponents, DFLer Tarryl Clark and IP candidate Bob Anderson, until public pressure from even the normally reticent mainstream media became too great. And now that we are less than a month out from the Nov. 2 election, Bachmann has cowardly agreed to a mere three debates—none of which will be before a live audience and only one of which will even be in her district. The most glaring example of how Bachmann has abrogated her duty to represent the 6th Congressional District is the October 7 debate sponsored by the Minnesota Broadcasters Association that was scheduled to be broadcast from WCCO’s television studios—again, insulated from a living, breathing audience of her constituents. According to Jim du Bois, president and CEO of the Minnesota Broadcasters Association, Bachmann was first contacted about the MBA debate in late August—at least five weeks ago. And then they waited. And waited. And waited. Further attempts to get Bachmann to commit to a debate sponsored by the organization that represents Minnesota’s broadcast community were futile. Was Bachmann too busy with her congressional duties that she couldn’t find time to even respond to the MBA, much less debate? Hardly. As it turns out, she had other priorities that superseded such menial obligations before the unwashed masses. 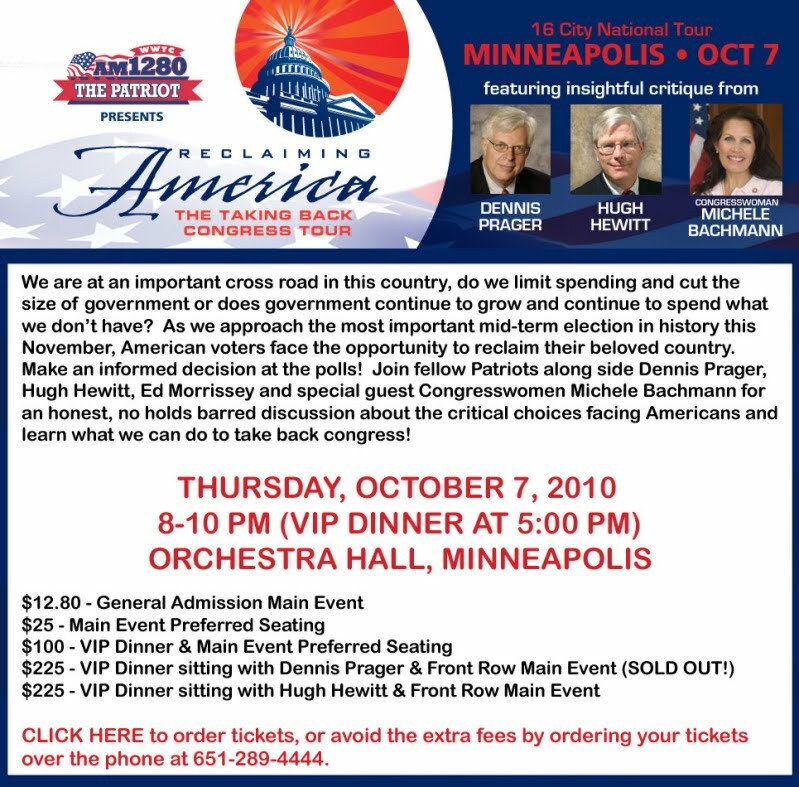 Bachmann was scheduled to offer her “insightful critique” at the “Reclaiming America: The Taking Back Congress Tour” sponsored by wingnut radio WWTC at Orchestra Hall that same night—a half-block away. 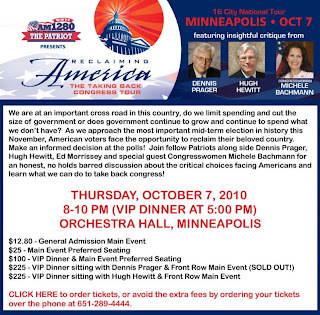 Clearly, the choice was easy for Bachmann: spend a night debating her opponents in the most expensive congressional race in America, or spend a night hobnobbing with the likes of Hugh Hewitt, Ed Morrisey and Dennis Prager at a $225-per-VIP soiree. This isn’t the only debate Bachmann is skipping out on. She couldn’t even find the time to respond to an invitation from the Stillwater Gazette, her hometown newspaper, to a debate it’s sponsoring Oct. 12 before a live audience in Stillwater. But that may be more understandable. Even her neighbors have rejected their local darling in her last two congressional elections, and facing that crowd could get a little uncomfortable. Sadly, Bachmann’s duck-and-cover strategy may work. The three debates to which she has agreed are being held during the last week of the campaign, giving little time for voters to digest their results before heading to the polls Nov. 2. Instead, they’ll have to settle for hearing from their congresswoman in a multimillion-dollar barrage of ugly tv commercials and a blizzard of glossy brochures in their mailbox. Better to keep ‘em dumb all over. October 7th would have been a bad date for debate anyway with the Twins in the playoffs. This article exemplifies just why the left and their candidates are despicable. oppressive and overbearing government; it is not the "teabagger party" which refers to the disgusting leftist homosexual practice of 'men' sucking on one another's gonads. 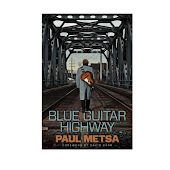 Only a fool, such as the author has so well demonstrated that he is, would confuse these activities. Secondly, Michele Bachmann is bonafide, that is she represents all of that which made the USA the greatest country on the Earth and none of the things that are contrary. She not only talks the talk, she walks the walk, and this leaves only useless auto-generated nonsense for those who would destroy this country to pitch at her. It wont work, save your breath. With opinions like that, I can see why you'd want to remain anonymous.